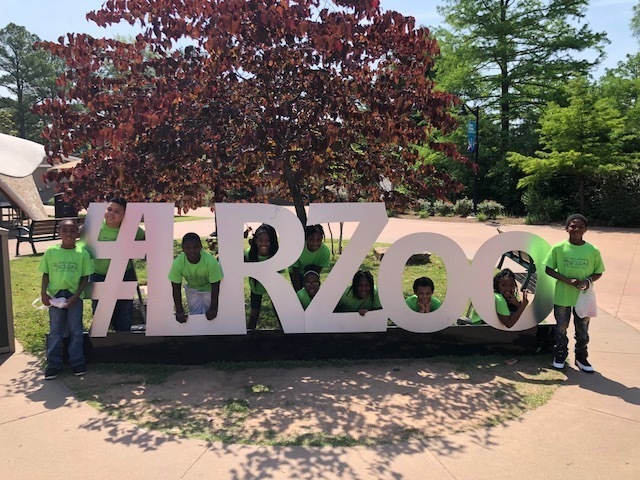 Participating students (1st -3rd) in the 21st Century Community Learning Centers Afterschool Program directed by Math Coach, Nicole Baker, at J. F. Wahl Elementary School visited the Little Rock Zoo today. They were rewarded this field experience by having good behavior, learning about and passing an AR test about zoo animals, and having good attendance. The 21st CCLC Afterschool Program provides a safe environment during non-school hours through a range of high quality services to support regular school-day academics and development such as tutoring, mentoring, academic STEAM enrichment, homework assistance, service learning, character education, and physical education. Pictured from left to right are some of the students who participated: Jordin Jones, Brayden Heard, Jaden Banks, Trinity Brown, Aakiyah Webb, Santeriyah Hunt, Aaliyah Webb, Anatasia Miller, Knea Lloyd, and Javaris Angel.